Robert F. Kennedy, popularly known as Bobby, served as Attorney General in his older brother John F. Kennedy’s administration and was later elected as a U.S. Senator. After his brother’s death, Robert Kennedy triumphed in politics. A bright future lay ahead when he won the California Democratic Primary on June 4, 1968, but an assassin’s bullet took his life only two days later. He became, like his brother, a political legend in American history, promising great potential, yet meeting a tragic, early end to his life and his country’s dreams. 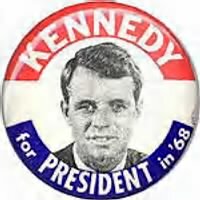 On June 4, 1968, Robert F. Kennedy, the younger brother of President John F. Kennedy, won the California Democratic Primary. Shortly after midnight on June 5, 1968, Kennedy gave a victory speech at the Ambassador Hotel in Los Angeles, California. After finishing his triumphant address, Kennedy exited the ballroom and traveled through the kitchen in order to reach a press conference. In the kitchen, Sirhan Sirhan shot Kennedy three times. An ambulance took Kennedy to Central Receiving Hospital and then to Good Samaritan Hospital for surgery. After hours of surgery, Kennedy remained in critical condition. On June 6, 1968, at 1:44 am PDT, Kennedy died. At his funeral services at St. Patrick’s Cathedral in New York City his brother Ted Kennedy said, "My brother need not be idealized or enlarged in death beyond what he was in life, to be remembered simply as a good and decent man, who saw wrong and tried to right it, saw suffering and tried to heal it, saw war and tried to stop it.” The death of this young and vibrant man weakened the morale of a weary and divided nation. Robert Kennedy embodied hope to so many, and with his death, the nation plunged deeper into the idealistic counterculture of the 1960s. "American Rhetoric: Edward Kennedy - Eulogy for Robert F. Kennedy". americanrhetoric.com. Retrieved on 2008-05-12. Looking for more information about Robert Kennedy?